Please try entering https://graph.facebook.com/484785678270294/photos?fields=source,link,name,images,album&limit=1000 into your URL bar and seeing if the page loads. Hey, Ansible Readers! We’re down in San Diego for Comic-Con 2013. If you weren’t able to make it, don’t worry we have more than enough pictures to make up for what you missed. If you do have a Comic-Con Badge, don’t miss our Complete ‘Ender’s Game’ Guide to SDCC 2013. 1. The ‘Ender’s Game’ Fan experience opens at 11 AM each day. 2. You can get a really neat ID badge with you picture on it from the Fan Experience. 3. Like last year, the Summit Entertainment booth is printing T-shirts. If you want one, you need to get a voucher from upstairs just outside of Room 20d. 4. If the ‘Ender’s Game’ bags and pins are currently sold out, don’t worry. Try again at another time, because they’re giving them out at random times throughout the weekend. 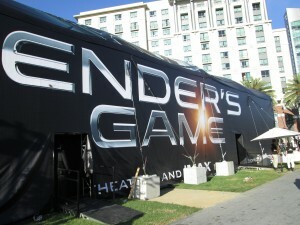 Below we have pictures from the ‘Ender’s Game’ Fan Experience, the Tor Books booth, the Smart Pop Books booth, and the Summit Entertainment Booth. Some of my favorite pictures include ‘Ender’s Game’ writer/director, Gavin Hood, and producer, Bob Orci. These two goofballs took some silly “bromance” pictures at the ‘Ender’s Game’ fan experience. Check them out after the jump! Edit: We added a few more pictures from the Fan Experience featuring Asa Butterfield and Hailee Stienfeld. Thanks, Michael! Source.